Ford Motor Company or simply Ford Motors, is an American car manufacturer based in Dearborn, Michigan. This company is currently the second largest car manufacturer in the US and ranks as the fifth largest in the world. Aside from its domestic operations, Ford also operates in the markets of South America, Europe, Asia Pacific, Africa, and the Middle East. Given its worldwide operations, Ford Motors could be considered as one of the most successful car makers. However, the company’s success did not happen overnight. In fact, it took more than 100 years before Ford was able to earn its current status. To provide a clearer picture of the company’s development, some of the highlights of Ford’s history are provided below. Ford Motor Company was founded by Henry Ford. The company was actually established with the help of Henry Ford’s acquaintance, Alexander Y. Malcomson, a coal dealer, and Malcomson’s uncle, John S. Gray, president of the German-American Bank. To further strengthen the newly established company, Malcomson recruited some of his business partners and urged them to invest. Due to Malcomson’s success in recruiting investors, the Ford Motor Company was finally established on June 16, 1903, with 12 investors and 1000 shares. Both Ford and Malcomson owned 255 of these shares, while Gray owned 105. The remaining shares were owned by the other 9 investors. The first stockholders meeting of the Ford Motor Company happened two days after it was formed. During this meeting, the election of officers happened. Gray became the company’s first president, while Ford was elected as vice-president. Under Gray’s leadership, the company had started to earn profits. Ford’s total profit in October 1, 1903 was calculated to be around $37,000. This profit further increased to $300,000 in 1905. But, after a few years of smooth operation, the harmonious relationship among investors was broken. Subsequent clashes between them eventually led to separation and Henry Ford’s assumption of the presidential position. Under Ford’s leadership, the company gradually became the largest car maker in the US. During the first few years, Ford as a car manufacturer, was involved in developing and producing its first car model, which was called the “Model A.” The Model A was powered by a two cylinder internal combustion engine, capable of producing 8 horsepower. Ford had sold a total of 1,750 units from 1903 to 1904. The impressive sales record obtained by the Model A marked the first successes of Henry Ford’s business. However, this model was eventually replaced by the Model C in 1904. The Ford Model C was actually a refined version of the Model A, with a sportier look and more powerful engine. Ford discontinued the production of the Model C in 1905 with a total of 800 units produced. This model was replaced by the Model F in 1905. In 1906, Ford developed its first six-cylinder powered vehicle and called it the Model K. This was a replacement for the earlier Model B. The Model K was powered by an in-line 6-cylinder engine that produced up to 40 horsepower. Despite its powerful engine, the Model K was considered a failure due to its expensive price and poor quality. Its production had reached its end in 1908. Ford then focused its attention on producing a succeeding model, which was the Model S. However, the demands for the Model S were not so impressive. As a result Ford then introduced the “Model T”. Ford’s Model T or the T-Model Ford is the company’s first affordable vehicle and at the same time one of the most in demand models. Its production started on August 12, 1908, with its first unit leaving the company’s assembly line September 27, 1908. The Model T started to establish its iconic image in the automotive market. Since it was affordable and middle-class Americans were capable of buying this car, the demand for the model increased. The 15 millionth unit of the Model T left the company’s factory on May 26, 1927. Production of the Model T continued until the end of the same year. After the overwhelming success of the Model T, Ford had produced a lot more models. Some of these were very successful, while several other models failed. The occurrence of the First World War had greatly affected the automobile production of the Ford Motor Company. Henry Ford’s pacifist policies were very successful in preventing the company’s downfall. In fact, the company became more popular in the First World War when Henry Ford joined other pacifists in Europe to prevent the war from happening. Although their efforts had failed to stop the war, Ford Motors Company became very active in supporting the Allied Power’s participation in the war. The company’s Model T eventually served as the underpinnings of some of the military vehicles, including the M1918 as well as the 1916 ambulance. Ford’s participation in the Allied Powers’ war effort continued until the First World War ended. Ford Motor Company started to lose its dominance in the automotive market a few years after the First World War, particularly when Edsel Ford was charged with being his father’s successor. The company’s gradual decline was caused by its continuous use of the personalized management mechanism, that was starting to become obsolete, as-well as the company’s neglect of consumer demands for more improved vehicles. The company’s sales were further worsened by the expansion of some of its closest competitors’ market share. General Motors and Chrysler were able to grab a significant share of the market from Ford by producing high-quality vehicles and providing credit opportunities to their customers. However, Ford was able to recover from its previous loses by providing similar opportunities to its customers. 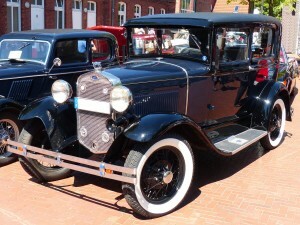 In addition to this, Ford’s stoppage of the production of the Model T and the introduction of the redesigned version of the Model A had placed the company back on track. Ford’s operation expanded into the luxury market division, when the company acquired the Lincoln Motor Company on February 2, 1922. This was followed by the company’s ventures on financing the cultivation of rubber in Brazil in 1928. The rubber cultivated would be used in producing synthetic rubber for use on Ford vehicles. However, this venture failed and only caused the company to spend millions of funds. The economic crisis and the collapse of the automotive market in the US, caused by the Great Depression, left some scars on Ford Motor Company’s image. In order to stay afloat, the company had to reduce its operation and implement mass lay-offs. As a result, a lot of Ford workers had lost their jobs. As economic conditions worsened, workers who lost their jobs formed a series of strikes to demand greater support from the company. However, the friction between the protesters, and the police erupted into violence. The police used teargas and water cannons to disperse the crowd, but the protesters responded by throwing rocks. The violence escalated and this forced the police and the company’s security to fire live bullets. As the battle ended, 9 individuals were killed and 60 others were seriously injured. Due to this, it took a few more years before Ford Motor Company was able to stabilize its vehicle production. Henry Ford’s pacifist mentality had once again guided his company’s fate during the Second World War. To prevent the Nazis from turning the Ford Motor Company’s plants in Germany into a nationalized factory, Henry Ford developed a close working relationship with the Nazi government. Ford’s efforts were effective since the company obtained the 52% ownership of the factories there. Although the Nazi controlled the day-to-day business of these facilities, Ford still remained as the majority owner. Henry Ford’s relationship with the German Nazi government remained good for a while. However, this had subsequently changed after the bombing of Pearl Harbor. This event encouraged Ford to provide support for the Allied Forces’ war efforts, by producing airplane engines. But, this doesn’t mean that Ford’s operation in Europe, particularly in Germany, had stopped. In fact, one-third of the trucks used by the Nazi army were produced by Ford Motor Company. Due to these strategies, Ford was viewed as a company that collaborates with both the Allied and the Nazis and earned a lot of investments from these sources. Ford’s direct communications and business ties ended when the US declared war in December 1941. However, there were some allegations that a series of indirect communications between the Nazi government in Germany and Ford still took place. But after an investigation conducted by the US Treasury Department, allegations were dismissed due to lack of concrete proofs. After the Second World War, Ford Motors had once again experienced internal chaos. Edsel Ford died in 1943 and left the company under the leadership of Henry Ford. But Henry Ford’s failing health made it difficult for him to handle the company’s business. Due to this, his wife and daughter-in-law intervened and demanded that Henry’s grandson “Henry Ford II” should be appointed as the company’s new president. They even threatened Henry Ford that they would sell their share of stocks if he refused to give in to their demand. Although Henry Ford was infuriated by this idea, he had no choice but to give in to the demand and appointed his grandson as the company’s president. When Henry Ford II became the president, he was faced with financial chaos with company losing about $9 million a month. This condition and Henry Ford’s death in 1947 forced the company to hire outsiders to handle its day-to-day business. The hiring eventually weakened the Ford family’s grip on the company. Ford Motor Company became a publicly traded company in 1956. During this period the Ford family only maintained a 40% controlling interest in the company. The rise and fall of high-ranking executives hired from outside the company continued up to the present. Despite the financial and leadership chaos that the company had experienced during these times, Ford Motors was still able to produce some of its most popular vehicles, including the Thunderbird in 1955, the Falcon in 1960, and the Mustang in 1964. In addition to this, the company was also able to establish the Ford Europe in 1967. High-ranking executives that were hired from outside the company and handle its operations continued to come and go. Harold Polding served as the company’s CEO and Chairman from 1990 to 1993. Polding was replaced by Alex Trotman and remained as the company’s head until 1998. Jacques Nasser replaced Trotman and served until 2001.William Clay Ford Jr., Henry Ford’s great-grandson, became the Chairman and CEO of the company from 2001 to 2005. In 2005, Alan R. Mulally from “Boeing” became the company’s President and CEO. In 2006, Ford Motor Company surprised the world when it announced that the company will offer all of its assets for mortgage since they could no longer handle the company’s operations. However, the US government provided assistance to the company. After a few years, the company, under the leadership of Alan R. Mulally, was able to pay some of its loans off and continue its production. With Alan R. Mulally’s effective leadership, Ford Motor Company is now enjoying significant sales profits and a revival of its financial strength. Buying a Car? Get your Ford Invoice Prices through our network of certified dealerships.